Those of you kitting out your homes with gorgeous decor items made from walnut, here’s a hall storage option to have you reaching for your credit cards. 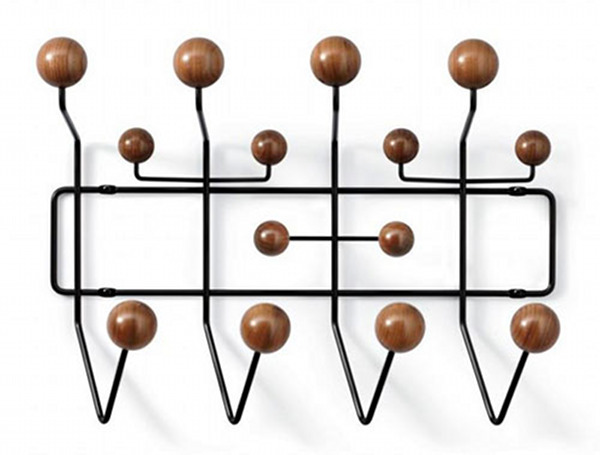 The Eames Hang It All, famous for its playful multi-coloured wooden ball hooks, has gone all grown-up in order to nab design buffs who like a more sedate aesthetic. I totally fancy the walnut version in a nursery featuring the stunning Ubabub walnut cots, the new Numi safety gates and the Herman Miller Spinning Tops, all topped off with a Mod Rocker. I might be going into walnut la-la land there but we think you’ll agree with us about the Hang It All’s beauty and functionality. I have two of the original versions in my hall and can say honestly they are the best hooks I have ever used! Be quick though, the walnut is strictly limited edition so it won’t be around forever. Buy for US$249 from Design Within Reach who suggest MyUS for parcel forwarding.